but how mysterious is the history of Easter Island? Since this article was first published, new research suggests Easter Island wasn't inhabited until 1200 CE. On a dusty speck of rock in the middle of the Pacific Ocean, one of the most celebrated cultures in history found a foot-hold into the popular imagination. The inhabitants of Easter Island created a cultural legacy that continues to resonate today as tourists flock to the tiny Chilean possession to see for themselves the impressive and distinctive statues, called Moai, which dot the landscape and stare with empty eyes toward the endless ocean. They stand on platform temples, called Ahu, which the islanders built up and enlarged over the course of centuries. Tourists are astounded by the fine craftsmanship and breath-taking beauty of Easter Island. Many believe a great mystery lies hidden there. Alternative history author Graham Hancock believes that Easter Island is a focal point for a vanished civilization whose influence stretches across millennia: "The mystery of Easter Island so far seems to have involved... the mystery of the master architects who first conceived the great Ahu and Moai [and] the mystery of the master scribes who understood the Rongorongo language," he wrote in Heaven's Mirror (1998). Decades ago, anthropologist Robert Suggs wrote a history of Polynesia that was a standard text on the subject. He firmly believed that archaeology had solved most of the island's puzzles: "The mystery of this island, then, is largely of an artificial nature, created for specific purposes by nonscientific authors." He implied that those authors seek only fame and fortune, not truth. For that reason, they obscure the history of the famous Moai. The Moai of Easter Island are usually dated to the period between A.D. 1200 - 1650, and are considered a late addition to the Ahu platforms, which originated with the founding of Easter Island. When I asked Graham Hancock to comment on the age of the statues, he told me in August 2001 that the archaeological dating is "probably correct as far as it goes, though not necessarily the whole story." He referred me to Heaven's Mirror for a full explanation of his views, so it is from their that I quote. 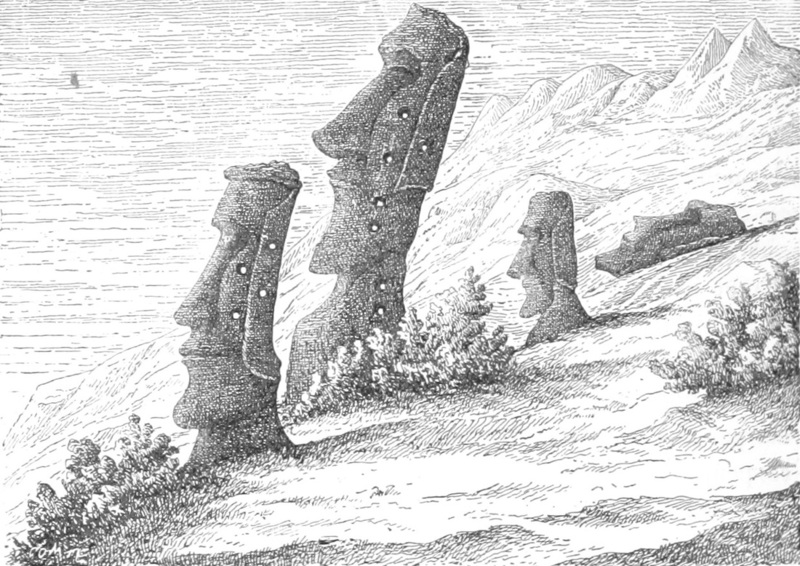 On the far fringes of the debate, ancient astronaut proponent Erich von Dänkien takes issue with the very notion that Easter Islanders carved the massive Moai at all. In Gods from Outer Space (1970), he suggested that "to leave the natives a lasting memory of their stay . . . the strangers [aliens] extracted a colossal statue from the volcanic stone. Then they made more stone giants which they set up on stone pedestals along the coast so that they were visible from afar." Of course, since there was nothing but limitless ocean, it was anyone's guess who would view the statues from afar. Von Dänkien, like Hancock, derives much of his information about Easter Island from Thor Heyerdahl, the Norweigan who undertook the Kon Tiki voyage to bolster his claim that Easter Island and Polynesia were settled by South Americans rather than Asians. Dr. Robert Suggs developed the current theory that Polynesia was settled by Asian immigrants. He gave an eloquent rebuttal to Heyerdahl's opus Aku Aku in his Island Civilizations of Polynesia (1960). Heyerdahl seems to have blazed the trail Zecharia Sitchin would later follow, since both men claimed they alone leanred the secrets of the ancients. Suggs sarcastically comments: "The Easter Islanders, of course, regurgitated the sum total of their esoterica for this impressive visitor, and he was shown all manner of secrets heretofore hidden from the eyes of white men," including never-before-seen sculptures Heyerdahl claimed depicted "aku-aku," or demons. Suggs adds that they actually "are the crudest of frauds." Heyerdahl postulated that the inhabitants of Tiahuanaco (Tiwanaku), an impressive stone city 3,000 miles away and high in Bolivia's section of the Andes Mountains, actually settled the island and brought their stone carving talents with them. Heyerdahl also argued that the Peruvian deity Viracocha was a real man, and furthermore, he was the leader of the Tiahuanaco invasion. Anthropologist Jared Diamond wrote in a 1995 Discover magazine article, "In the 1950s, Heyerdahl argued that Polynesia must have been settled by advanced societies of American Indians, who in turn must have received civilization across the Atlantic from more advanced societies of the Old World. Heyerdahl's raft voyages aimed to prove the feasibility of such prehistoric transoceanic contacts." "Heyerdahl's Peruvians must have availed themselves of that classical device of science fiction, the time machine," Suggs wrote, "for they showed up off Easter Island in A.D. 380, led by a post-A.D. 750 Incan god-hero, with an A.D. 750 Tiahauanco material culture featuring A.D. 1500 Incan walls, and not one thing characteristic of the Tiahanaco period in Peru and Bolivia." Suggs took a very dim view of Heyerdahl's conclusions: "This is equivalent to saying that America was discovered in the last days of the Roman Empire by King Henry the Eighth, who brought the Ford Falcon to the benighted aborigines." "Connections between Easter Island and Tiahuanaco automatically force themselves upon us. There, as here, we find stone giants belonging to the same style," he said in Chariots. "It is more than 3,125 miles from Tiahuanaco to Easter Island. How can one culture possibly have inspired the other?" Of course, the mystery was quickly solved for ancient astronaut authors. They said Viracocha was the leader of an alien group who inspired both cultures: "I also suspect that the same masters gave lessons on Easter Island, at Tiahuanaco, above Sacsayhuaman, in the Bay of Pisco and elsewhere," von Däniken said in Gods from Outer Space. "We wonder also whether the very real similarities that have been noted linking Easter Island, Tiahuanaco in South America, and various anomalous megalithic structures in the Pacific, might have as much to do with such an ancient and indirect, third-party influence -- touching all these cultures -- as with the direct contacts that did also undoubtedly occur between them," he wrote in 1998. The undoubted contact is usually described as the lowly sweet potato because "the sweet potato... could only have been introduced from South America," according to Hancock and Heyerdahl, though studies by Pacific botanist E. D. Merrill (Plant Life in the Pacific, 1945) showed as early as sixty years ago that sweet potatoes originated in Africa or South Asia and then moved across the Pacific. However, sweet potatoes are not the only plants that authors use to support their theories. The issue of trees on Easter Island has also been a contentious one. When Heyerdahl moved a Moai with the aid of wooden rollers, von Dänkien harped on an old idea in Gods from Outer Space: "Nevertheless, archaeologists all over the world protested against this example. . . [T]hey claimed that no finds had yet supplied proof that the islanders ever had wood at their disposal as building material (for rollers)." Von Dänkien assured his Chariots readers two years earlier, "No trees grow on the island, which is a tiny speck of volcanic stone." That is true today, but was it always? The UnMuseum website perhaps sums it up best: "When the first Polynesians landed on Easter Island, around 400 to 700 A.D., what they found was far from a barren land. The island was a sub-tropical paradise. Thick forests of palm trees covered the hills." Years of careful archaeological exploration and pollen analysis confirmed that trees existed in abundance early on. In fact, the islanders only began to build in stone when they had begun to wear down the island's tree resources, according to anthropologist Jared Diamond. In a 1995 Discover magazine article, he said that they used the last of the trees to move the Moai into place in a last-ditch attempt to appease their gods and restore the prosperity their environmental degredation had caused. By the end, Diamond says "[t]hey also turned to the largest remaining meat source available: humans, whose bones became common in late Easter Island garbage heaps." So how did Heyerdahl, Hancock and von Dänkien (also spelled von Daeniken) go so wrong? "Heyerdahl and Von Daeniken both brushed aside overwhelming evidence that the Easter Islanders were typical Polynesians derived from Asia rather than from the Americas and that their culture (including their statues) grew out of Polynesian culture," says Diamond. Hancock merely followed after his predecessors, even though by the time he wrote Heaven's Mirror (1998), Jared Diamond's article was three years old and Robert Sugg's book was turning thirty-eight. "Such sophisticated skills are the hallmarks of an advanced civilization. To find them brought together and focussed on a remote island in the Pacific, apparently at once, is extremely hard to explain in terms of normal 'evolutionary' processes usually ascribed to human societies. An alternative that many scholars have considered, therefore, is the possibility that the Easter Islanders did not in fact develop these skills in splendid isolation, but rather received them as an influence -- as a legacy -- from elsewhere." As we saw just moments ago, that legacy is very real -- not at all a wild possibility, though not from Hancock's lost civilization. In fact, as Diamond said, it came from Polynesian culture, of which Easter Island is just one part. Almost all the islands bear megalithic ruins since Polynesian religious life, especially that of Tahiti and the Marquesas (from which Easter Island was populated), was focused on stone platforms and courtyards. These temples became the platforms, or Ahu, of Easter Island, and the statues were elaborations of the Marquesan and Tahitian statue traditions, according to Diamond and Suggs. I asked Graham Hancock about these other statues, and he told me, "Although there are other statue making cultures in Polynesia (e.g. see examples from Tahiti) they don't look specially like Moai to me." Only one other point remains to be examined, the mysterious Rongorongo script written on wooden tablets that supposedly "proves" that Easter Island is separate from the rest of illiterate Polynesia. Von Dänkien says this writing "is astonishingly like Chinese," and Hancock argues that it is a legacy from a lost civilization because it is a mystery "how and why the script and the tablets ever came into existence at all." Well, years before either author, Robert Suggs wrote that the Polynesians were descended from Southeast Asians swept from their homes by Chinese invasion, so a similarity to Chinese writing is not anomalous, if true. Also, Suggs wrote that "writing was probably once part of the Polynesian heritage everywhere, although its use was restricted, of course, to the priestly and upper classes for ceremonial purposes only." The reason no writing remains elsewhere is also simple, "Although produced on wood on Easter Island, it was evidently written on highly perishable bark cloth in Tahiti, and on leaves in the Australs." The complex language of the Polynesians simplified as it spread out across the Pacific, and writing slowly faded away, presumably because it was no longer needed on the small, isolated islands where the Polynesians now lived. On Easter Island, the so-called "Navel of the World," it continued as a hold-over from the distant past, and today no one can read the symbols that once were understood over thousands of miles of ocean. Today, alternative authors maintain that the Moai of Easter Island are more than just a magnificent cultural accomplishment, that they are in fact remnants of outside intervention. More than forty years ago, anthropologist Robert Suggs note that "the romanticist or adventurer . . . must create an aura of mystery and enigma about the 'Navel of the World' in order to make his theory more attractive, whatever the basic motivation may be." As long as that remains true, Easter Island will forever remain locked in the unfathomable vaults of mystery no matter how much research is done or how many explanations are put forward, for no one can ever conclusively prove a negative. "Maybe" and "perhaps" will forever remain possibilities, however remote.